Update: Online Registration is now active! Please send e-mail of interest to me at ebb8 at pitt.edu, ideally by 21 April: See our post on the Digital Mitford project blog for details. We invite you to join members of the Digital Mitford project team from Wed. June 28 through Friday June 30, 2017 for the Fifth Annual Workshop Series and Coding School, hosted by the Pitt-Greensburg’s Center for the Digital Text. E-mail your interest by Monday April 3; and send registration fee (described below) by Monday May 15.
to share knowledge of TEI XML and related humanities computing practices with all serious scholars interested in contributing to the project. Our Prezi for the Digital Diversity Conference in Edmonton, Alberta. 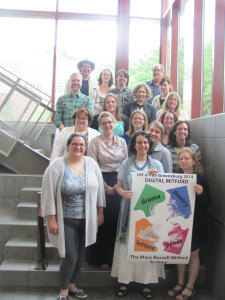 Here’s a link to our our Prezi presentation for our Digital Mitford panel at the Digital Diversity Conference in Edmonton, Alberta, for 9 May 2015. This conference celebrates the 20th anniversary of The Orlando Project and the Women Writers Project, and it was wonderful for us to be invited to propose and give a panel on the Mitford project here! Elizabeth Raisanen, Lisa Wilson, and I will co-present, and Elizabeth’s task is to introduce us by discussing how our project responds to the history of digital archives and databases on women authors. Lisa and I will discuss our project, workflow, and training methods, and show some of our data visualizations–our co-occurrence networks and mapping experiments thus far. Just posted on the Digital Mitford blog: Please join us for our Digital Mitford Coding School at the end of May 2015! We call for participants and prospective new editors to join us from Wed. May 27 through Sunday May 31, 2015 for the Third Annual Workshop Series (or Coding School) of the Digital Mitford: the Mary Russell Mitford Archive, at http://mitford.pitt.edu. Please join us if you want to learn text encoding methods in Digital Humanities through hands-on participation in a large-scale digital archive project now well underway. We are happy to teach what we know and are learning, and to orient you to coding with hands-on experience on our active project as part of our end-of-May three-day workshop series. Our workshops are held at the lovely Pitt-Greensburg campus (http://greensburg.pitt.edu) during the last week of May 2015. We expect people to arrive on Wednesday May 27 and depart on Sunday. May 31, with our workshops running during the days from Thursday morning May 28 through Saturday evening May 30. Greg has discovered a photograph of Mary Russell Mitford in the Reading Central Library Catalog! 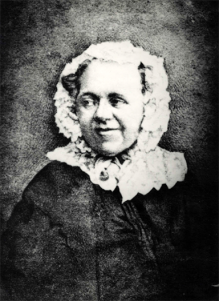 The photo was taken by Henry Fox Talbot, and is one of a kind of early photo that he invented called a “Talbotype”, roughly contemporary with the daguerrotype. The Talbotype is apparently undated, but it must be from the 1840s or 50s, since Talbot pioneered his photographic method in 1841. We’ve added it to our little carousel of Mitford images on the Digital Mitford project site.